Getting a DUI, or Driving Under the Influence conviction can be heartbreaking and devastated time in a persons life. It affects not only you, but those around you have been impacted by the act of driving while intoxicated. You may suffer the loss of reputation, incur heavy financial costs, have to attend mandatory alcohol-education classes and alcoholics anonymous sessions, suspension, or revocation of your driver’s license, the cancellation, or high increase in your current auto insurance, installing an IID (ignition interlock device) in your car and possibly jail, or prison time. Getting a DUI in Southern California is especially devastating because many commuters travel by freeway and our public transportation system, is not the best in the country. If you work in Los Angeles, then losing your license can have a big impact on your ability to make it to work when you need to and being able to freely drive around the busy streets of Los Angeles becomes a difficult task, when faced with having to install an interlock ignition device. If you have been convicted of a DUI within Los Angeles County, you will be required to install an interlock ignition device into your vehicle. You will be required to have the device installed for no less than 5 months and be required to pay a monthly fee of $75 to have the device periodically recalibrated. *There is a device installation fee, as well as a DMV fee. As a Los Angeles DUI Attorney, we aggressively defend your DUI case both in the court system and at the DMV hearings. We fight hard to develop a strong strategic defense, so that your case is handled with the utmost care and precision. A Los Angeles DUI Attorney is your best source for getting the answers you need and the defense you want! We will investigate all possible reasons why the police would have pulled you over, how your performance on a field sobriety test (FSTs) will impact your case and whether, or not the breathalyzer they used for the testing, has had prior instances of failing. The technology used in the breathalyzer machines are not based on an exact science and therefore are open to thoughtful criticism and scrutiny. We will investigate thoroughly the procedure the police used was lawful and carried out professionally. As a Los Angeles DUI Attorney, Balali Law’s aggressive and professional attitude in the court has lead to many charges being significantly reduced, or flat out dropped! If we can effectively demonstrate any weaknesses in the prosecutor’s case, police stopping you without a proper reason, the breathalyzer machine malfunctioning, insufficient alcohol absorption, that would show you weren’t legally intoxicated, or any other proof in your favor, then we can greatly reduce the severity of your charges and, or have them thrown out. If you are looking for a Los Angeles DUI Attorney then CALL the Law Office of Mark Balali Esq. You have at least 10 days after your arrest, to secure a DUI Attorney for the DMV hearing and effectively build a case against them in your favor. We can request the necessary hearing with the DMV, so you don’t have to. Doing so, allows me the opportunity to challenge the DMV with your case, so we can potentially protect your license. However, it is important to note that, DMV hearings are seldom successful for most parties. DMV decisions are separate from the court and therefore operate under their own set of rules. If you have retained our services, or any other DUI Attorney after the 10 days of your arrest, you will be automatically suspended from having a working license and will need to apply for a Restricted license. This process would work by requesting a DMV hearing, by forwarding a notice to the Driver Safety Branch of the DMV, informing them that I am representing you as your attorney and to initiate a “stay of suspension” on your record. The DMV would then not be able to suspend your license, until after we have been afforded the opportunity to challenge them in a DMV hearing. 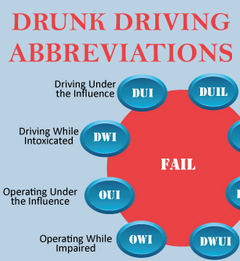 Check out this Infographic on DUI Police Abbreviations & Better Understand your DUI Report. To view the original post, see the LifeSafer Blog. If a DMV hearing is not requested by either you, or myself then your license will automatically be suspended by the DMV without a hearing taking place. A restricted license my be applied for 30 days after your suspension and requires that you are enrolled in a DUI course and that you purchase SR-22 Insurance. Your restricted driving abilities will be limited to driving to and from work and to your required DUI courses. NEVER drink and drive, obviously! Have a Designated Driver available to transport you and, or others around. If you do drink and have no designated driver, then call a cab or contact services like Uber, Lyft, Flywheel, Curb, Summon. As a Los Angeles DUI Attorney, we will work tirelessly to represent you at the DMV hearing and the court. We take great pride in providing you with tried and true experience and walking you through the entire process to alleviate any confusion you may have. We want you to know full well the process and status of your case and leave you with peace of mind that everything is being done to fight in your favor. If you or someone you know has received a DUI recently, contact a Los Angeles DUI Attorney at the Law Office of Mark Balali Esq. Call NOW for a FREE consultation at: (310) 431-9774, or contact us online and or via social media.